When I’m hiking, I like to watch for rock basins, sometimes as small as cupped hands, that appear along summits and ridgelines. These are “thin places.” When filled with water, these tiny quivering pools offer a deep plunge into time. Basins run the gamut from Star Lake, a half-acre tarn beside New Hampshire’s Mount Madison, to dripping bonsai and moss gardens small enough to encircle with your arms on Mount Cardigan in Orange, N. H., to chalices of wind-churned puddles perched on the chin of Mount Mansfield in Vermont. Some of my favorites are “potholes,” the smooth rock bowls formed when pebbles and flowing water drill deep into the rock. Of course, most mountain ridges don’t have flowing water today. There is a cascade that I visit often, just down the hill from where I live. In this spot the river has cut down through softer rock and created a swarm of potholes. I can easily soak my feet in some of these holes, while others suggest a cold and wild jacuzzi. Many of our New England cascades have these features, carved into active riverbeds, but largely formed thousands of years ago as the glaciers melted down at the end of the last Ice Age. Famous examples include the Basin in Franconia Notch, N. H., Sculptured Rocks in Groton, N. H., and Texas Falls in Hancock, Vt.
Aside from the well-known potholes, these water-carved rock features also appear surprisingly far from streams. In fact, a few appear on dry mountain cliffs. These remarkable features testify to the vast ice that covered all New England. Walking up Mount Jefferson in New Hampshire, along the Caps Ridge Trail, most hikers tarry at a prominent outcrop to enjoy the thundering stream hundreds of feet below. But underfoot, and perilously close to the edge of the cliff, is a series of holes drilled into the rock. Some are dry. Others are vessels that hold rippling water, mineral colors, skylight and shadow. Here on the side of the mountain, a still higher mountain of ice once stood. As it melted, ice and rock fragments plunged down a crevasse, bearing down at the very edge of the cliff. The glacial flow bored into the ledge with a furious slurry of abrasive stones. This powerful drill-set is called a “moulin,” or mill, by geologists. In November, I walked up the Hedgehog Trail to Burnt Rock Mountain in Fayston, Vt. As I headed uphill, the foot bed of the trail eventually became a stream of ice, slush, and meltwater that scoured away the freshly fallen leaves. The summit of the hill is a slab of dark gray schist studded with purple garnets and swirls of blue-white quartzite. These minerals are exceptionally hard. Their resistance to weather and erosion has allowed the summit to remain uplifted above the Mad River and Champlain valleys to the east and west. South of the summit and the steep ledges, just off the trail, I found what I was looking for: a mossy, fir-shadowed well. The Burnt Rock Mountain pothole is only an arm’s reach across, and a bit deeper. Once drilled by immense power and abrasive stone, the pool has been tranquil for thousands of years. 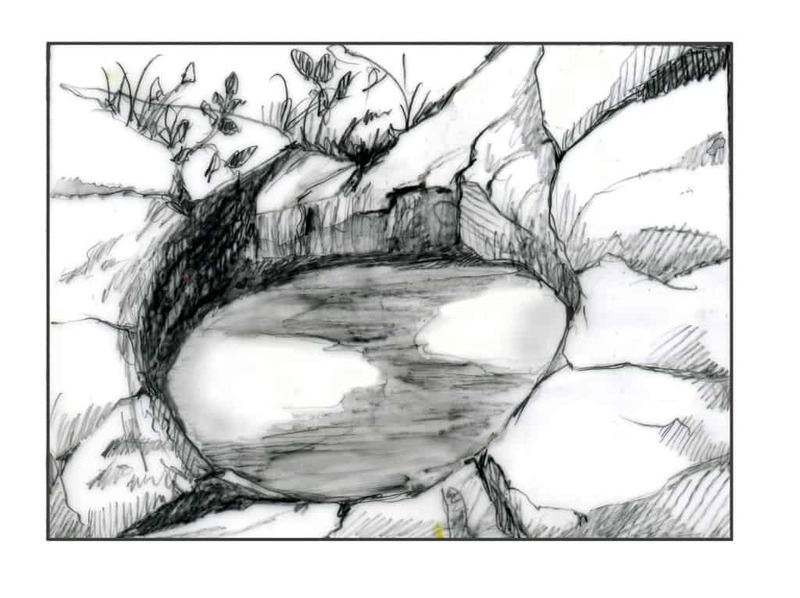 Now, the pool is refreshed by a trickle of water emerging from a rock crevice. A hundred miles south of here, on the side of Vermont’s Mount Equinox, there’s evidence of another glacial moulin’s power. Glacial melt-water carried crushed schist off the mountain cap and drilled holes in soft white marble. Some of these marble chalices hold water and reflect the stars and clouds above. Some do not. They are truly thin places: portals that pass entirely through the rock, to reveal the open air and valley below. Ned Swanberg is a naturalist living in Montpelier Vermont. The illustration for this column was drawn by Adelaide Tyrol. The Outside Story is assigned and edited by Northern Woodlands magazine, and sponsored by the Wellborn Ecology Fund of New Hampshire Charitable Foundation: wellborn@nhcf.org. A book compilation of Outside Story articles is available at http://www.northernwoodlands.org.